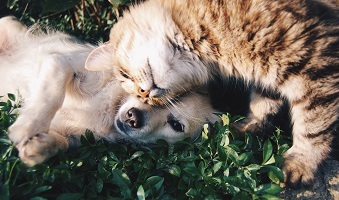 Just because you have a cat and a dog living together doesn’t mean they need to be enemies. So how can you help them live together more peacefully and even become the best of friends? Let’s find out together. Here are some tips for helping your pets share the same home. Just because you have a cat and a dog living together doesn’t mean they need to be enemies. Here are some tips for helping your pets share the same home. Some breeds of dog are prey-driven, which means they will chase cats. It’s an instinct of theirs to go after anything that can run away from them. This means that you’ll need to have a conversation with the breeder or the shelter where you get the dog from about whether or not the pets will be compatible. You can retrain a prey-driven dog to not do this anymore, but it will take time and effort, which you might not be able to spend. Another good suggestion is to introduce them carefully. Your pets can be highly territorial, no matter what order you introduce them in; our furry friends are protective of their humans. Keep your dog on its leash so it can’t chase the cat. Likewise, make sure the cat won’t try to bait or provoke the dog. They might eventually learn to playfully run after each and bat at each other, but the first couple times, it could be tense. Make sure to give both the dog and the cat plenty of treats! All pets love getting treats, but it’s important not to spoil them. However, for special occasions such as a first meeting, treats can help both learn that being around each other can be rewarding. Lastly, let the cat lead. If it gets spooked, they should have someplace safe to go where the dog can’t follow. Both animals need some time to get used to the other, especially if they have bad experiences with other animals that have made them afraid of each other. This entry was posted on Friday, January 25th, 2019 at 4:50 pm. Both comments and pings are currently closed.